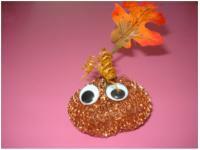 These adorable little pumpkins will look great on your table the day of your Halloween party. 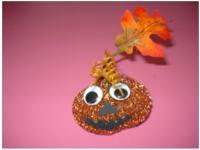 They are also perfect on windowsills or hanging in your Halloween tree! 1. Gather your materials. 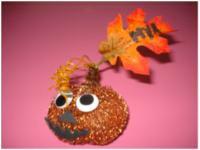 You will need copper sponge scrubbers, wiggly eyes, black Fun Foam, scissors, brown or green pipe cleaners, white or hot glue, a permanent marker, and fabric autumn leaves on plastic stems. 2. 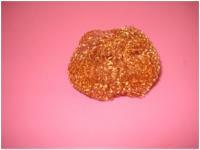 Stretch and plump the copper sponge scrubber with your fingers to give it a pumpkin-like shape. 3. 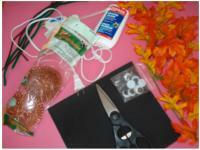 Select a fabric leaf and cut the stem, approximately 3 inches under the leaf. Insert the leaf into the copper sponge scrubber. 4. 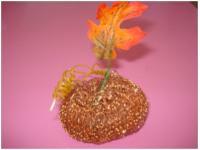 Wrap a brown or green pipe cleaner around the top of the copper sponge scrubber and the plastic stem to hold them in place. 5. Glue wiggly eyes on the copper sponge scrubber. 6. Cut a triangular nose and wiggly mouth out of the black Fun Foam and glue them in place to complete your shiny pumpkin. 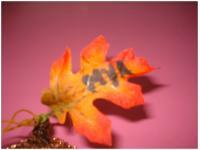 Use a permanent marker to write the child's name on the leaf and use as a place card for your Halloween party!